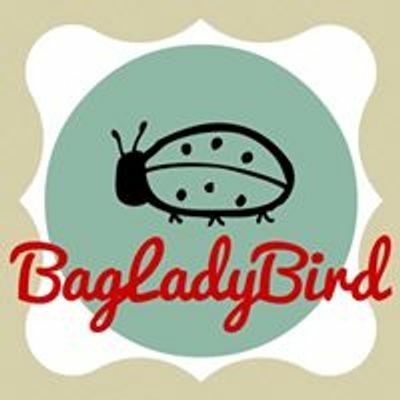 Overwhelmed and a little bit terrified by your overlocker? Learn to thread, sew, change colours and troubleshoot with confidence and understand your overlocker in a 1 hour one to one lesson with our dressmaking tutor, Alison. Confidence with your overlocker helps you up your sewing game. You can neaten seams and sew stretch fabrics more quickly and with ease and get a more professional looking finish. Your tutor, Alison, will take you through threading up your overlocker step by step and will help you to understand the function of each of the 4 threads and how they come together to form a stitch. You will then sample different seams and fabrics to gain an understanding of the various controls on your machine; tension, stitch length, stitch width and differential feed and how to troubleshoot when things go wrong. We’ll touch on how to keep your machine in tip top condition will finish up by changing your threads using the tying-off method. 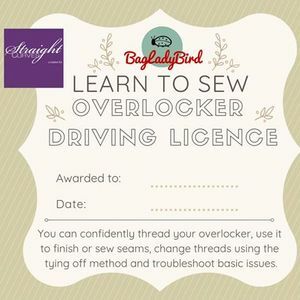 Anyone who owns an overlocker (aged 16 years and over) but has never used it or threaded it or feels they are not using it to its full potential. Bring yourself, your specs (if you need them), your overlocker, the manual and any accessories and tools that came with it. If you have a specific fabric you would like to use on your overlocker, please bring that along. Do not forget your power cable/foot pedal! You might want to bring a notepad to take notes, if that is your learning style. Please ensure your overlocker is in working order. No refunds will be issued if your lesson cannot go ahead due to any mechanical or technical failure of your machine. 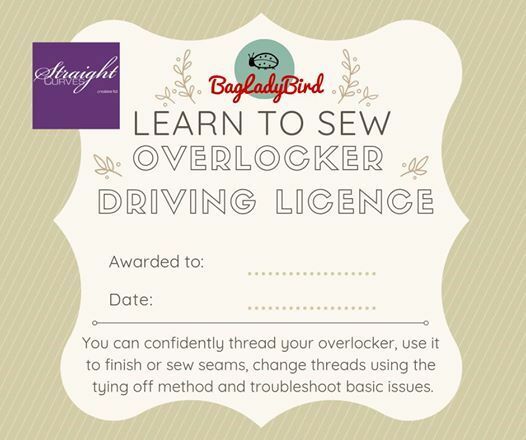 You will go home with your Overlocker Driving Licence, all the samples that you create throughout the session and a new confidence with your overlocker.